Rtd. 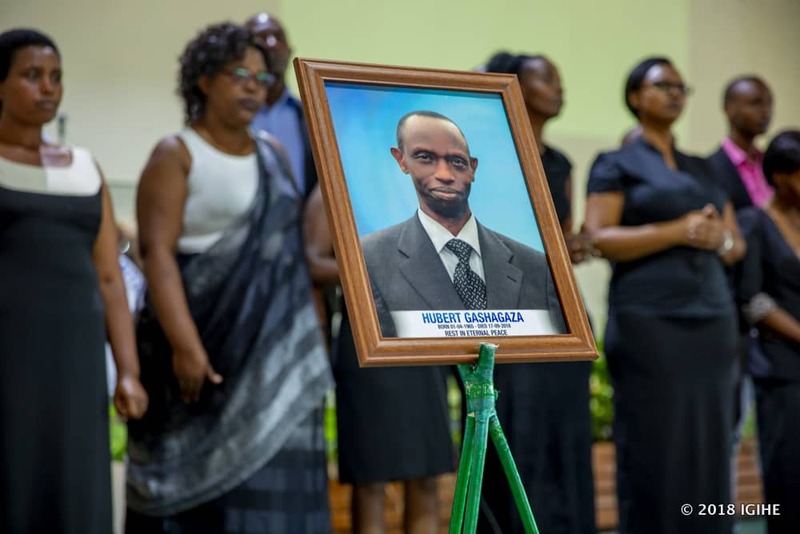 Chief Superintendent Hubert Gashagaza was laid to rest at Rusoro cemetery on Thursday, September 20, 2018, amidst friends and family’s grief. The 53-year-old retired officer who served as the Spokesperson for the Rwanda National Police in the Southern Province was found dead on Tuesday night, September 17, 2018 in Ndera Sector, a suburb of Kicukiro District, Kigali. Relatives and friends who had gathered to pay their tribute all emphasised how he displayed professionalism in his career and also remained a friendly officer. “Your time on earth will forever be remembered. May God bless you for it all, I love you,” Paola proclaimed. In her short eulogy, Chantal Uwimana, Gashagaza’s wife, said that her husband’s loss has left a huge gap. “Your loss will leave a huge gap in our lives. I will not forget you. The love and courage you always displayed will forever be remembered. I love you,” Uwimana said. Meanwhile, Rwanda Investigation Bureau (RIB) is holding two suspects in the murder of the deceased. He said that Gashagaza might have been strangled. Rtd Gashagaza was son to Saratiyeri Munyentwari and Esther Mukamusoni. He was born in Ruhango, Southern Province, on April 1, 1965. He is the first born in a family of eight; five boys and three girls. His parents were killed during the 1994 Genocide against Tutsis. He was married to Chantal Uwimana in 1995 and has left four daughters and a son. Gashagaza was among the first Rwandan Youth who joined the Rwandan Patriotic Army (RPA) in Uganda in 1987. Among other duties, he served as a Peacekeeper in Central Africa Republic.